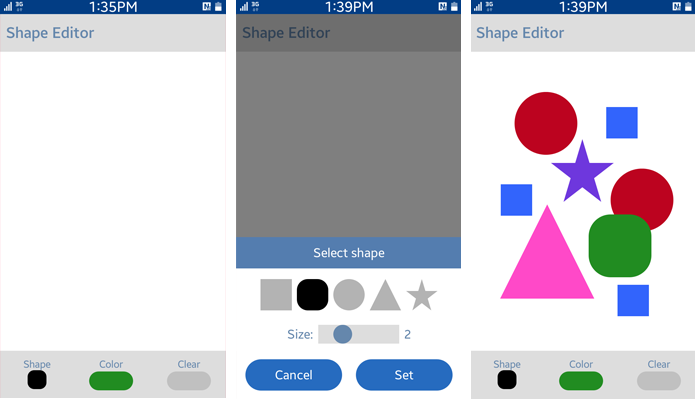 The Shape Editor sample application demonstrates how you can create and edit various shapes using SVG (Scalable Vector Graphics). The following figure illustrates the main screens of the Shape Editor. Click Shape to select a specific shape and the size of the shape. Click Color to select the color of the shape from a color picker. Click Clear to remove all the shapes on the SVG canvas. Use graphic elements to create shapes in the SVG board. Attributes, including size and color, of the shape can be defined in the tag. Since SVG elements are graphics defined in XML format, the innerHtml property is not supported with the SVG elements. The touchStartHandler() method is called when the touchstart event is triggered. It uses the changedTouches array event property to access the data of the current touch object. The current touch data is saved to the drawPath object, which is an associative array indexed with the identifier parameter of the current touch object. The touchMoveHandler() method is called when the touchmove event is triggered on the SVG elements. It moves the element around the board following the path of the touch points. The touchEndHandler() method is called when the touchend event is triggered, and it adds a new shape into the SVG board. The pageX and pageY properties of the touch object represent the coordinates of the touch point. After a new shape is inserted, the method resets the drawPath object to remove the information about the touch that no longer exists.